There is no doubt that my kids and I read every single day. But unfortunately, we also watch a lot of television, play at lot of video games, and spend an incredible amount of time on the computer. I'm embarrassed to admit how addicted we are to our "screens," but I have a feeling that we aren't alone with this problem. And that's why I love being part of Random House Children's Books' Unplug & Read Tour! 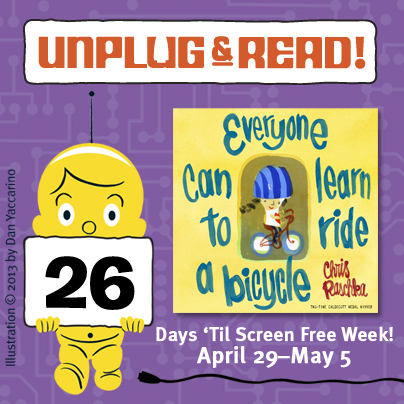 Screen Free Week is taking place April 29th through May 5th which is only 26 days away! To celebrate, I am reviewing a fantastic new picture book that will be available next week from an award winning author and illustrator. 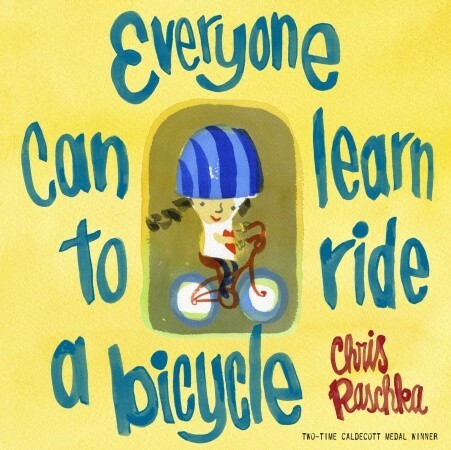 EVERYONE CAN LEARN TO RIDE A BICYCLE written and illustrated by Chris Raschka is an absolutely delightful children's book for kids... and adults. Kids will love this insider's look at what it takes to ride a bike, and parents will be touched when reading about this important childhood milestone. EVERYONE CAN LEARN TO RIDE A BICYCLE is the story of a father teaching his young daughter how to ride a bicycle. It starts with picking out the perfect bike and follows the process until the little girl is riding the bike on her own. Of course, it isn't always easy, and there are a few bumps and bruises along the way. I thought this picture book was adorable for so many reasons; however, it was the little messages in the story that really captured my heart. For example, the father is extremely encouraging. He starts by having his daughter watch other riders so she will see that, "They all learned how." He then builds her confidence with the step-by-step training wheel process but admits along the way that it can be "a bit scary." And finally, after the little girl falls, the dad is there to hug her and offer even more encouragement and "to try it again, and again, and again...."
I have to say that when the little girl took off on her own, I had a little lump in my throat. While my husband was the one to teach our kids to ride their bikes, I was out there with my camera trying to capture ever single moment of the adventure! For parents, having their child learn to ride a bicycle is such a huge milestone. It just screams, "Our baby is growing up!" Between the wonderful illustrations and the encouraging messages in EVERYONE CAN LEARN TO RIDE A BICYCLE, I just loved it. But don't just take it from me. This picture book has already received starred reviews from Booklist, Publishers Weekly, School Library Journal, and Kirkus Reviews. When you see it it for yourself, you'll have no problem understanding why! 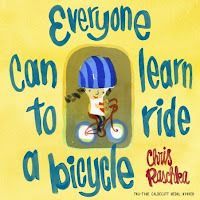 EVERYONE CAN LEARN TO RIDE A BICYCLE is a precious picture book and should be part of every family's home library! Imagine going about your day without the trappings of screen media: no phones, computers, tablets, televisions. Preschoolers today spend as much as 4.1 to 4.6 hours per day on one screen or another. Including multi-tasking, children 8 to 18 spend 7.5 hours per day with screens. This Spring, Random House Children’s Books is issuing a challenge: UNPLUG & READ during Screen Free Week April 29 – May 5. Inspired by Dan Yaccarino’s Doug Unplugged (On sale February 12, 2013) about a robot who discovers that the real world trumps the virtual, we are launching Random House Unplugs: A Screen Free Week promotion. We are committed to supporting teachers, librarians, booksellers and parents in their efforts to encourage children to UNPLUG & READ during Screen Free Week from April 29 – May 5. Screen Free Week is the annual celebration from the Campaign for a Commercial-Free Childhood (CCFC) that encourages turning off screens and turning on life. CCFC’s Screen Free Week is a creative response to growing public health concerns about the unprecedented time children spend with entertainment screen media—television, computers, video games, and smart phones. Studies show that Preschoolers spend as much as 4.1 to 4.6 hours per day using screen media. Including multi-tasking, children 8 to 18 spend 7.5 hours per day with screens. Unplugging for one week provides an opportunity to reset media habits, establishing a healthy, sustainable tradition of media consumption in households and schools. You can follow the Unplug & Read Tour on Random House Children's Books Facebook page! I am ****so***** in favor of an unplug and read campaign! It scares me to see how little young kids read now in favor of computer games! That looks like a fantastic book! I still get teary-eyed whenever I see someone teaching their child to ride a bike. When Vance was in elementary school, they had "TV Turn-Off Week" every year. It's hard to believe we've evolved to so many more screens to occupy our time since he was that age. What a terrific book! I don't have kids, but it worries me when I read about how many of them are practically glued to TV, computer, and smart phone screens. I love the idea of this campaign!